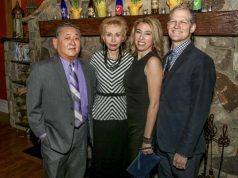 Robyn and Bob Coupe come to Ocean City from their home in Downingtown, Pa. every year around Easter to visit family. The kids, Declan, Bobby and Catelyn got a jump start on the fun. 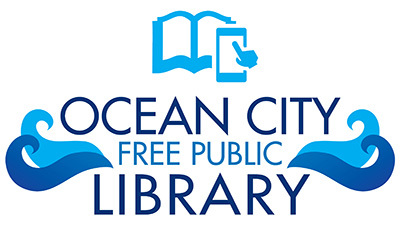 Whether you live in Ocean City, or just come to visit, there will be a familiar theme in the spring and summer seasons – fun, with loads of activities and entertainment lined up. 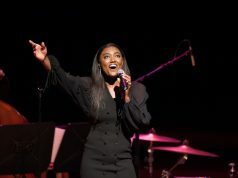 But what makes it even better – whether you’re heading to a show at the Music Pier, coming off the beach after a sun-splashed day or going to one of the action-packed amusement parks – you will be strolling down a new Boardwalk. The final phase of a $10 million, multi-year Boardwalk reconstruction project was completed last month. So, from Fifth to 12th streets, there are not only fresh boards under your feet, but also new gazebos to give you refuge from the sun’s rays or a quiet place to nibble on a slice of pizza or take in a good book. Jody Levchuk, co-owner with his brother Randy of Jilly’s Boardwalk businesses, says the new Boardwalk, gazebos, new stores and attractions make the season especially exciting. “The biggest thing this year is the new Boardwalk,” said Jody Levchuk, owner of several Jilly’s businesses on the Boardwalk. He added that the city did an excellent job putting together the budget to plan for the improvements. Levchuk and his brother, Randy, own three Jilly’s T-Shirt Factory businesses, Jilly’s French Fry Factory, Jilly’s Ice-Cream Factory and will soon open Jilly’s Candy Factory. Their parents, Paul and Jill Levchuk, own two Boardwalk businesses, The $1 Store and Jilly’s Arcade. Jilly’s Candy Factory will really be a fun place for all ages, Levchuk said, hinting at songs that will emote nostalgia and new tunes that will keep the younger generations intrigued. “It isn’t just about getting candy, it is about the experience,” he said. The candy store, which will feature candy shoots and some other displays that are reminiscent of Willy Wonka & The Chocolate Factory is opening in May. 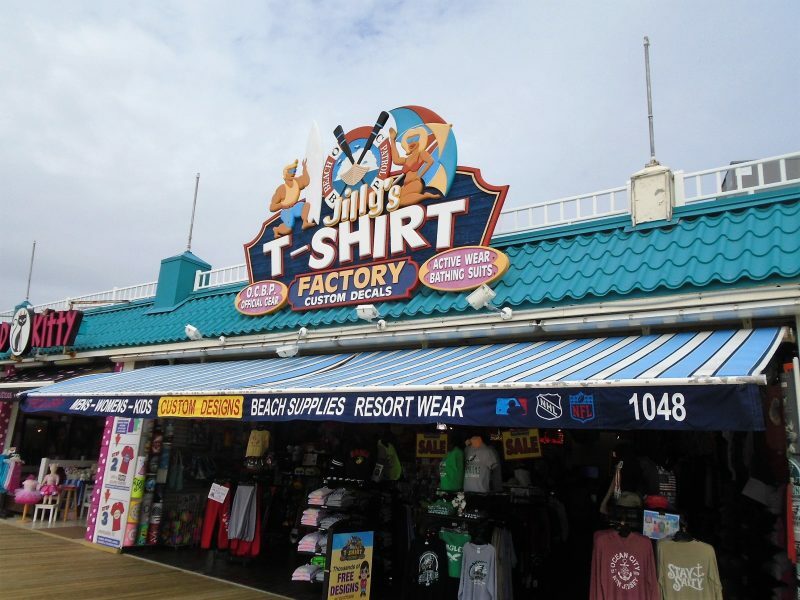 Jody Levchuk, co-owner of Jilly’s T-Shirt factory on 10th and Boardwalk says his family is ready for a booming season. For the Levchuks, they take great interest in the Boardwalk looking its best to provide a place for tourists and residents to enjoy shopping, amusements and, of course, the beach. “It isn’t just one thing or another. 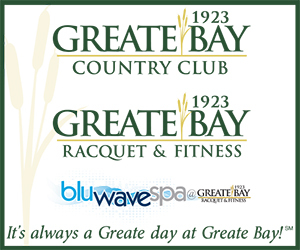 There is a whole lot going on, on a daily basis,” Levchuk said. For example, Breezin’ Up, a retail store, has been in Ocean City for 30 years and is expanding. 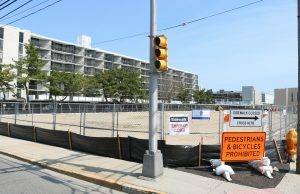 Improvements, expansions and new businesses are all testaments that businesses and the city are committed to making the Boardwalk successful, Levchuk said. Then he showed some minor improvements, including a new walkway paid for by the businesses. “It won’t really make us a dollar, but it is another sign that we are all working in the same direction. The look is cleaner and more polished,” he said. 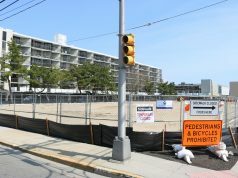 A new business is coming to the Boardwalk at the corner of 11th Street that will feature virtual reality and escape rooms. “It will be another thing to do,” Levchuk said, adding it is an activity young people enjoy. 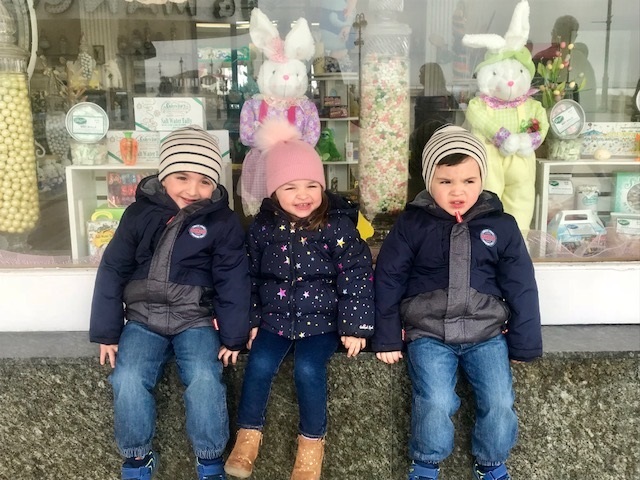 Four-year-old twins Garret (left) and Liam (right) and 3-year-old sister Payton Friel pose for photos with Easter bunnies in the shop window downtown before heading to the Boardwalk with mom Debbie Friel. You can’t really call it the tourist season, however. Levchuk said most of the people who come down in early spring are second homeowners. “They come down to enjoy family and go to events and both amusement parks,” he said. Robyn and Bob Coupe come to Ocean City from their home in Downingtown, Pa. every year around Easter to visit family. Their children Declan, Bobby and Catelyn love it, they said. They spent time walking the boards on Wednesday and then posed for pictures next to the Playland’s Castaway Cove pirate. They each like something different about Ocean City. Caitlyn likes the beach and her brothers like the arcade and the rides. Debbie Friel takes her three children, 4-year-old twins Liam and Garret and sister Payton, 3, back from a trip to Manco & Manco pizza. The Pennsylvania family comes every year around Easter to visit family in Ocean City. Debbie Friel brought her children, Payton, 3, and 4-year-old twins, Liam and Garret, for some pre-Easter fun Wednesday. The family lives in Wallingford, Pa., but came down to visit grandma in Ocean City. Their first stop was to check out some Easter gifts downtown and take pictures with the Easter bunny. 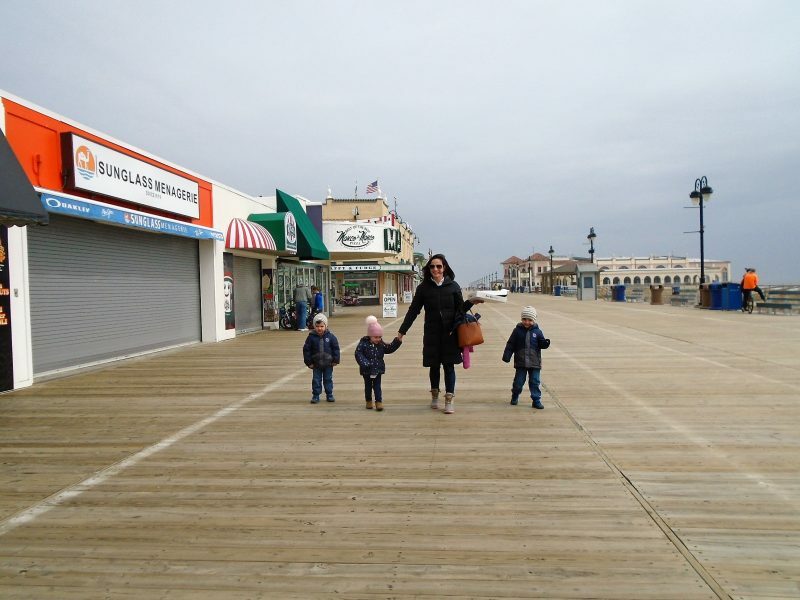 Then they made their way to the Boardwalk happily to get their favorite slices at Manco & Manco Pizza. Amusement parks are gearing up for the busy season. Brian Hartley, vice president of Playland’s Castaway Cove, said the amusement park will be open April 7 and 8 from 12 p.m. to 5 p.m. to start the season. It will continue to feature all the rides, games and attractions it has for many years. But this year there are two major improvements to entice thrill seekers to Playland – the Gale Force roller coaster will return with a smoother ride. It is set to open in May. 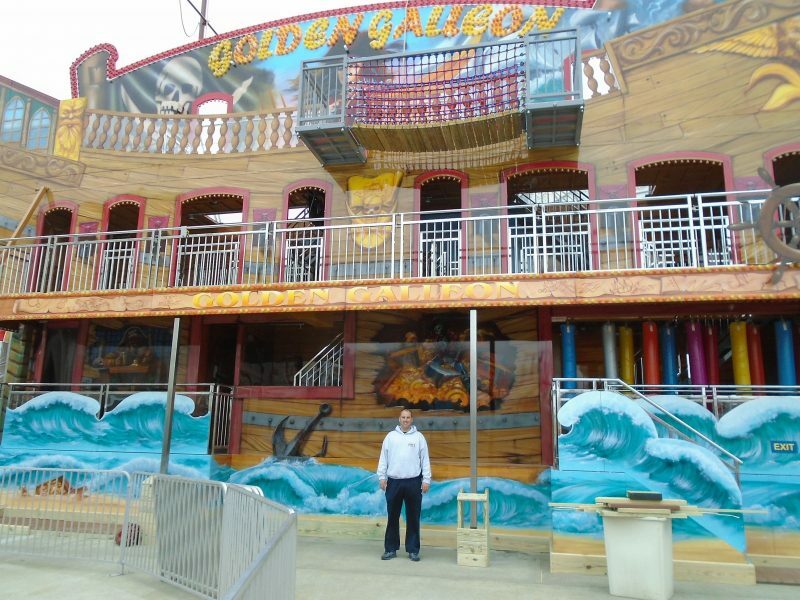 Brian Hartley, vice president of Playland’s Castaway Cove, says the new fun house Golden Galleon opens next weekend and will provide three stories of fun. And a new Golden Galleon ship-like fun house promises three levels of laughs and surprises. LED lights, fun house mirrors, rollers, a bridge and some other cool features will make for an adventure. The fun house is expected to be open next weekend, Hartley said. Hartley added that the amusement park always has old favorites to keep families returning. “We have something for the whole family – rides and amusements for all ages,” he said. Playland is offering its half-price sale that runs through April 8. 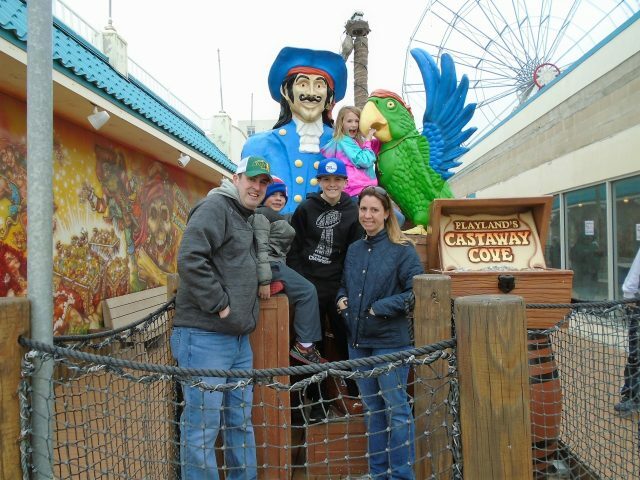 Gillian’s Wonderland Pier, Ocean City’s other popular amusement park has many rides for all ages including indoor rides, a haunted dark ride, a log flume, scooters and a scrambler, is also currently selling half-price tickets and will be open for Easter and on the weekends. 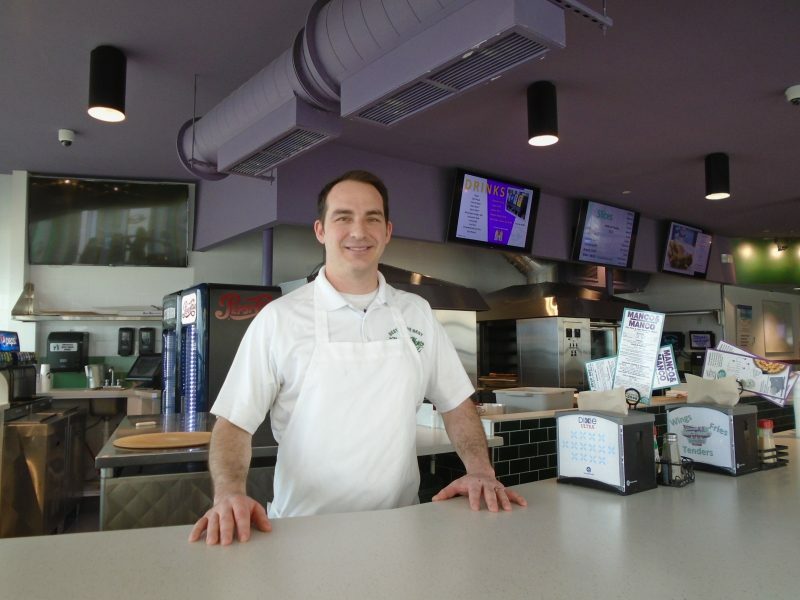 Tom Rossi, general manager for Manco & Manco Pizza says he and his staff are ready to make lots of pizzas this season. 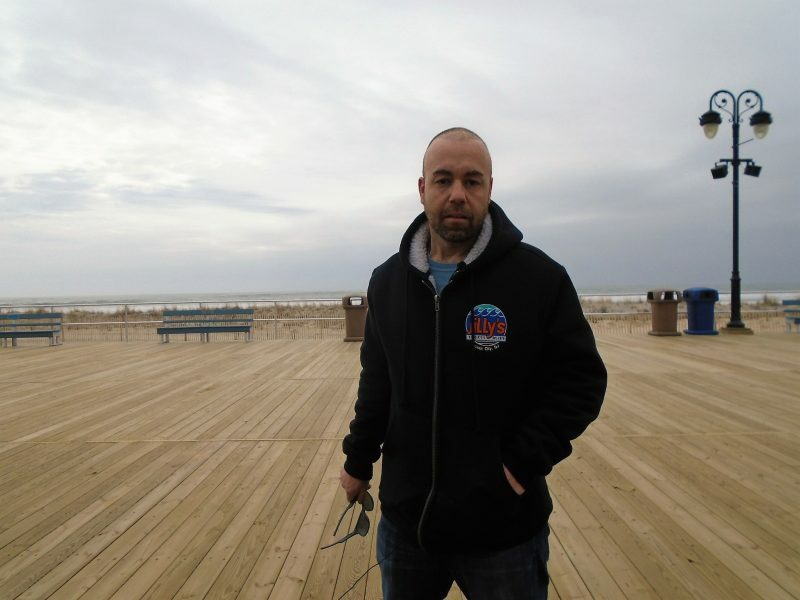 For Tom Rossi, general manager for Manco & Manco Pizza, with three locations on the Boardwalk, getting ready for the spring and summer can be hectic. Especially since they are busy throughout the year. On a busy weekday afternoon, he took a few minutes to talk.